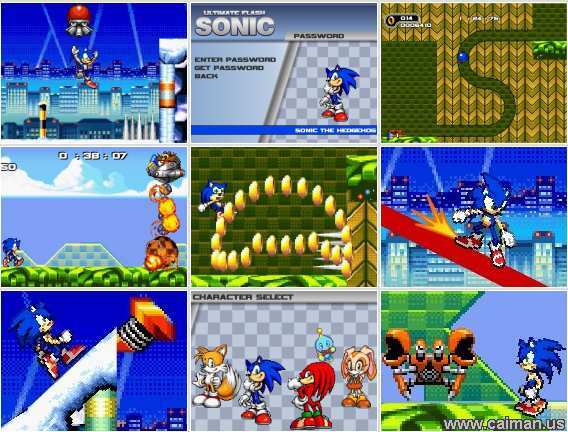 Caiman free games: Ultimate Flash Sonic by Dennis Gid. 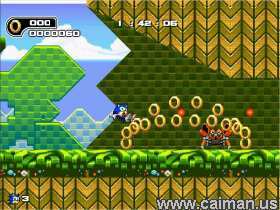 In this two level Sonic game, the object is to make it to the exit while grabbing as many gold rings as you can along the way. As you can expect there are many obsticles such as crabs, spikes and bees. Some of these obsticles cause you to loose all your gold rings, so you must gather them all up again. At the end of each Act is a boss. You can choose from one of four characters to play:Sonic, Tails, Knuckles, and Cream, with 2 more to unlock. In this game there are passwords and cheats. There are two modes of play, Main Game and Time Trial. Everything about this game is excellent: animations, sound and graphics. The only sad thing it: It is to short. To perform a spin dash: hold down arrow, press space bar, release down arrow. There are two modes to play: Main game and Time trial. The game includes passwords and cheat modes. 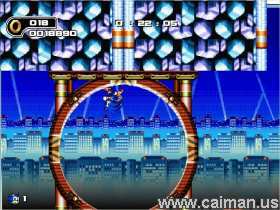 If you like Sonic or platform games: Get Ultimate Flash Sonic! Authors homepage (nothing there) .